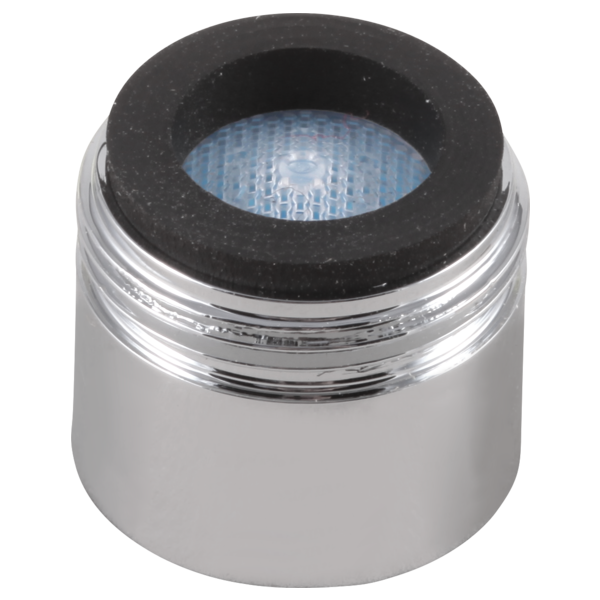 Is it possible to get only the inner plastic aerator part? This seems to clog very quickly, even though we have a whole house water filter and water softener. Very expensive to keep buying the entire part. What is the thread size on this aerator? Thank you for your question. Delta Faucet model # RP64874SS has a metric thread size of 18 X 1-6. Are there adapters for this aerator for attaching a countertop water filter? I have a countertop water filter that attaches directly to the faucet. Are there adapters that replace this aerator? If so, where can I obtain them? Thanks. What are the thread specifications of this aerator? What are the thread specifications of this aerator?, For example: M18 X 1-4g6g MAJOR &Oslash; 17.974-17.794 (.7076-.7006) PITCH &Oslash; 17.324-17.249 (.6820-.6791) MINOR &Oslash; 16.891-16.633 (.6650-.6548) Please fill in the correct numbers. Paul, thank you for your question. The thread specifications for Delta part #RP64874 (1.5 gpm) is M18x1-6g.